It was late spring, and there were bushes along the sides of the road sporting tiny white blossoms. I knew, as I had known for decades, that this was a precursor to berry cobblers and jelly. The blackberries were in bloom, and from the abundance of blossoms and the mild weather at the time, I knew it was shaping up to be a really good blackberry year! Then the county bushhogs came through and mowed down everything along the county right-of-way. I was frustrated that this wonderful gift from God had been destroyed, but it was, after all, just the right-of-way — four or five feet along each side of the road. There still were plenty of blackberries on my road. Then the power company sent men to spray under the power lines. Everything along the road that happened to be under the power lines turned brown within days. The berries — which were just starting to ripen — turned white. It was beginning to look as if the blackberry bushes would disappear before we had eaten the first berry! 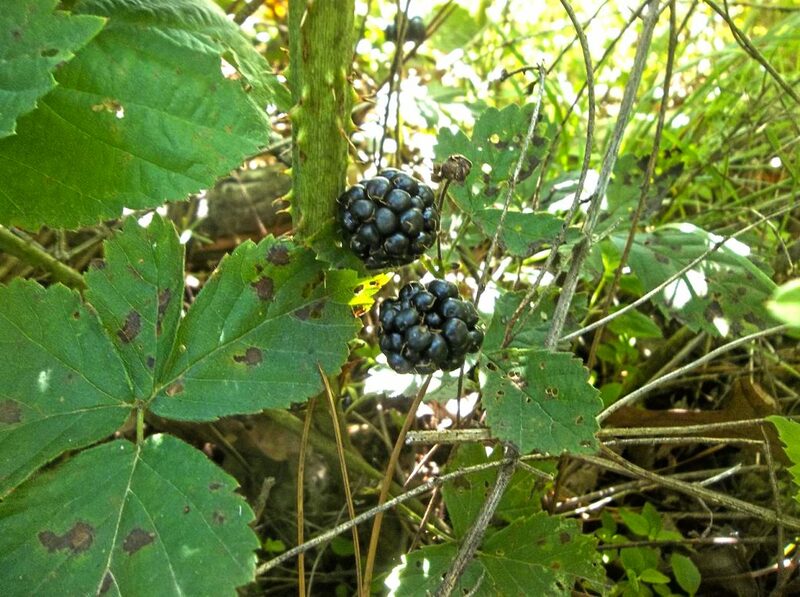 In the hope that there might be berries along the rough roads that trailed through the timberlands on our mountain, we went on an exploratory picking a week later and found there were still plenty of blackberries. My husband put the truck in 4-wheel-drive, and we began going out twice a week, picking about a gallon an hour between the two of us. 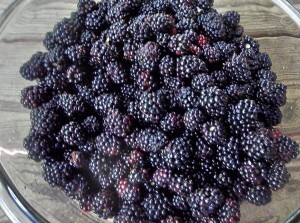 We picked small, sweet berries, as well as enormous black ones as big as my thumb. Dress appropriately. If you have long hair, fasten it back so it won’t get caught in the brambles. Wear a hat to help prevent heat exhaustion. Wear light-colored clothing — and no perfume — to avoid unwanted attention from stinging insects. Thick, heavy pants will protect your legs from briars. And tuck your pant legs into your socks to keep chiggers and ticks from crawling up your legs. Protect against insects. Some people use an insect repellent like DEET, but I don’t like to, because the poison might contaminate my berries. Wear boots. I prefer leather boots that extend above my ankles, but heavy rubber boots would work as well. High-topped boots protect against snakebite. Boots are important, too, for stomping down big brambles to retrieve the berries underneath or to clear a path to inaccessible fruit. 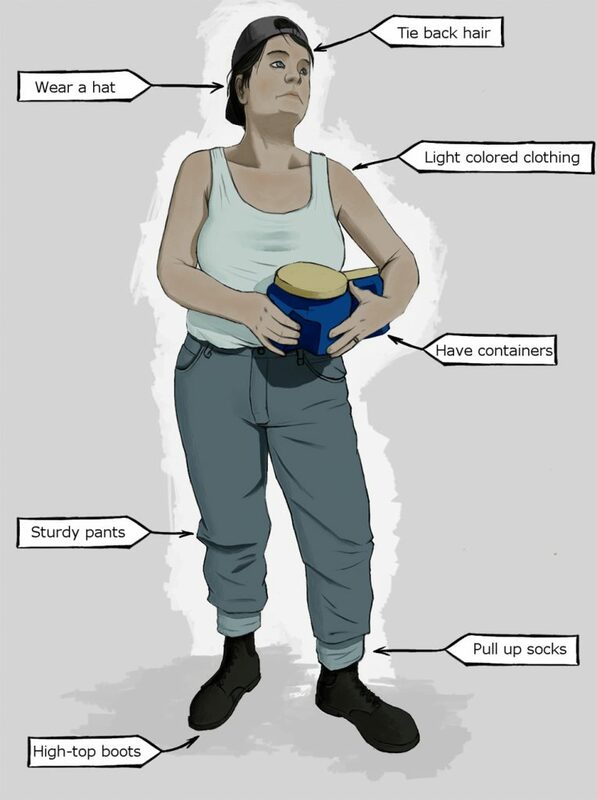 Carry sufficient containers. Figure on gathering about ½ gallon per person per hour, if you can pick a long time in one place without having to drive to a new location. A milk jug that’s been washed thoroughly will serve, if you cut a hole in the top big enough to put your hand in. 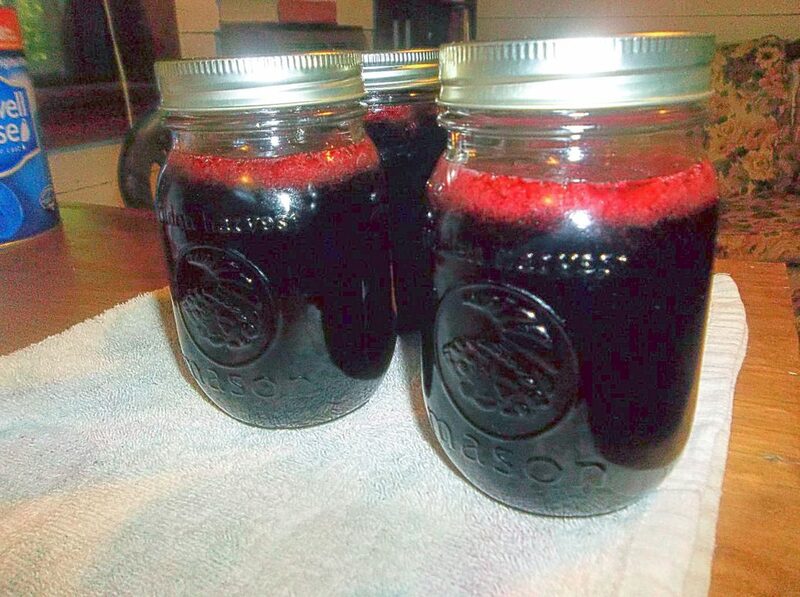 I use coffee cans and put the lid back on as each can is filled with berries. Take water with you. Berry picking season is hot weather season, so make sure you won’t get dehydrated. When you go out looking for a good place to pick berries, don’t pass by a spot where you only see a few berries, or where the berries are still red. Usually, the ripe berries are less visible until you get up close. I can’t tell you how many times we stopped the truck for “just a couple of berries” and ended up picking for half an hour! Lift the big brambles to see what’s hanging underneath, look on the ground, and look up into the lower branches of the trees. Dewberries resemble blackberries, but they ripen a little earlier. 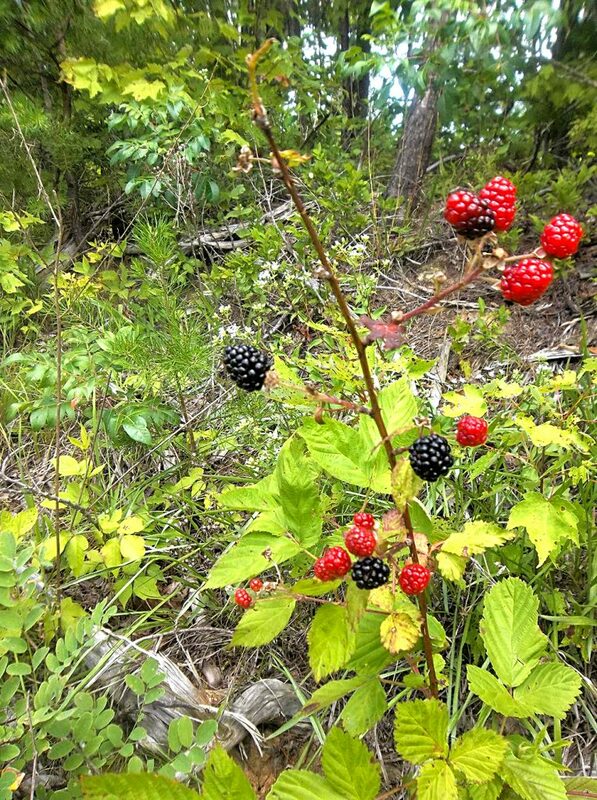 Generally, dewberries are larger and juicier than blackberries. They grow along the ground and are not as plentiful, growing one to a stem, rather than in clusters. Dewberries let you know the blackberry crop is coming. Dewberries look like blackberries, but they are generally larger and juicier than blackberries, and they come in a week or two before them. 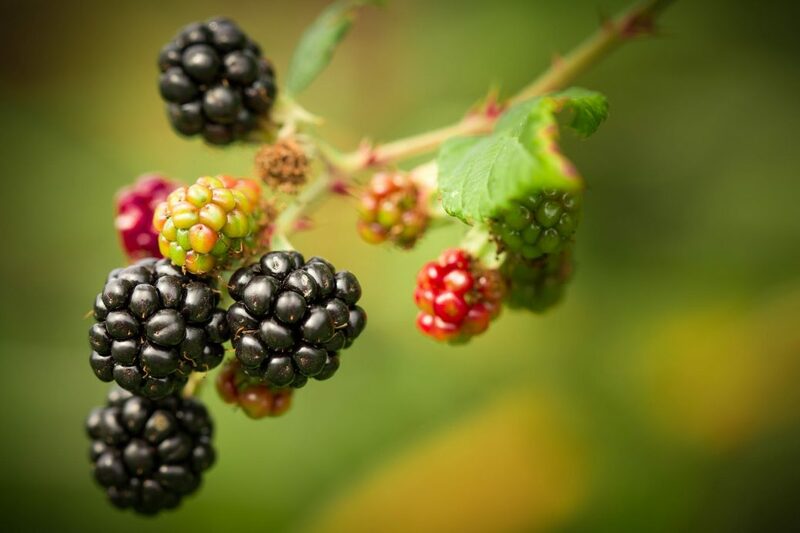 They grow along the ground, and are singular — just one per stem, rather than the cluster of berries you usually get with blackberries. I pick the dewberries and throw them in with the blackberries. Blackberries ripen in waves. The berries that are red today will ripen in a few days, allowing a second and third harvest. Some of the obstacles that keep the faint-of-heart out of the briar patch are snakes, chiggers, ticks, and the ever-present thorns. Where I live there are plenty of copperheads and rattlesnakes, but I know they don’t want to see me any more than I want to see them, so I just let them know I’m coming. Picking in silence and enjoying the “solitude” of the forest is a really bad idea. Make lots of noise. One day, when I was picking a hundred yards or so from my husband, I yelled, “Boo-boo!” before stepping into a new briar patch. The next patch we stopped at, I heard my husband yell, “Boo-boo!” as he started to pick. And we haven’t seen a single snake so far in this blackberry season. Chiggers and ticks are a greater deterrence to many people than poisonous snakes. Chiggers are microscopic bugs that cause itchy welts where they bite. Ticks are a well-known blood-sucking parasite that can carry such diseases as Rocky Mountain spotted fever and Lyme disease. Both can produce itchy bumps where they bite that stay with you for days. To reduce your problems with chiggers and ticks, try closing up any entrance into your clothing from the chest down. That means tucking your shirt in and pulling your socks up over the cuffs of your pants. When you get home, the first thing you should do is strip down, throw your clothing in the washer, and take a shower. Normally, it takes a few hours for the pests to latch on, so taking a shower right away usually will get them off in time. As far as the thorns are concerned, different people choose different solutions. My husband prefers to wear a long-sleeved shirt to protect his arms, even when the weather is hot. I wear a tank top and just remove any thorns that snag my skin. Remember that blackberry thorns are hooked, so the best way to remove them from your clothing or skin is to push them backwards … gently. 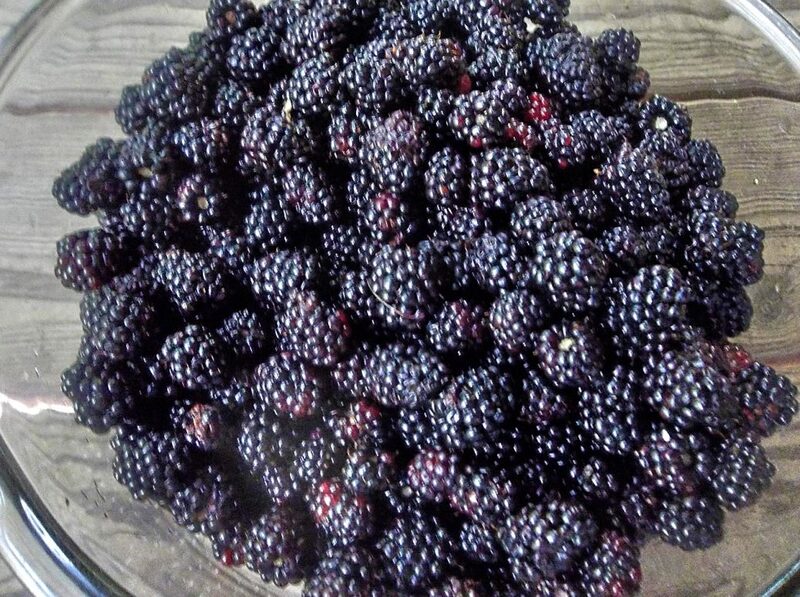 When picking blackberries, remember to throw an occasional half-ripe berry in with the ripe ones, because these have more pectin, which helps jelly set. Watch out for bugs and fungus on the fruit, picking only those berries that are clean, ripe, and healthy-looking. Berries come off the twig easier if you snap them to the side, rather than pulling them straight off. While picking, look around you. We saw wild turkeys two of the last three times we picked, and the second time it was three hens with their chicks. We also saw deer tracks, and thought we saw a deer in the distance one time, headed away from us. I also take advantage of the opportunity to scope out other berries that will be ripening in the weeks to come. 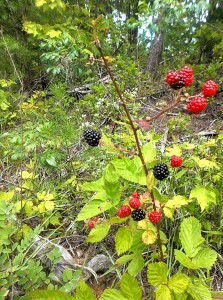 When the blackberries are ripe, huckleberries, elderberries, and wild grapes are only a few weeks away from being ready. I like to look around to see how they’re coming along and where they’re located, so I can make plans to come back and pick at a later date. Once you get home with your treasure, you need to make sure to handle the berries gently, to avoid crushing them. If you wash your berries, be sure to freeze them immediately. If you wash them and don’t freeze them, they are likely to be covered with fuzzy mildew by the next day. It won’t hurt simply to refrigerate them in a covered container (as they are) until you’re ready to use them in making jelly or a cobbler, or any another recipe. Wash them right before you use them, picking out any stems, leaves, and dead bugs when you do. Blackberry jelly — just one of the wonderful, fresh-tasting treats that a successful blackberry season can provide for the dead of winter. And be sure to go back a few days later, for a second harvest. More berries will ripen in the interim. A good blackberry crop will last for about three weeks. But the good fruit of all your labor — jelly, jam, cobblers, and muffins — will last for months to come! 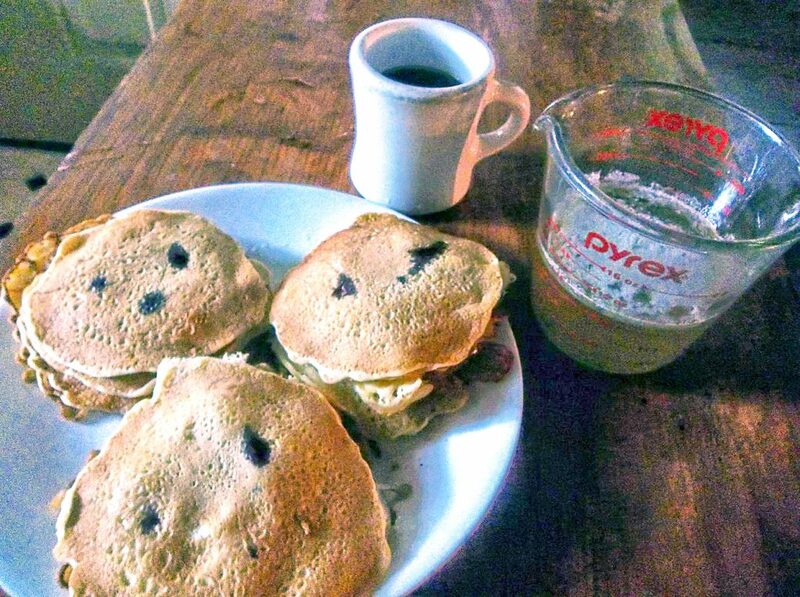 Blackberry pancakes are a great way to start the day. Melt 2 Tbsp. butter in skillet over medium heat. In large bowl, mix flour and sugar. Stir in milk and melted butter. Beat eggs and add to batter. Mix until all ingredients are blended, then gently stir in berries. Spoon onto hot, greased skillet. Cook over medium heat until edges begin to brown and bubbles rise and pop in the center of the pancake. Then flip with a spatula and cook about the same amount of time on the second side. Remove to platter and continue cooking all pancakes. Add a small amount of butter or oil as needed, to keep pancakes from sticking to the pan. Top with honey or syrup. Serves six. Karen House lives on a mountain in Tennessee with her husband of 30 years, where they welcome their children and grandchildren regularly. Karen’s alter-ego is Granny Fisher, sharing her wisdom and views on life at her blog — http://womaninthewilderness.weebly.com.